Well we still don't know if that would work for Tom Bancroft, he said on the first post that the typical bracket and plank will not work, because of the decking which he never posted a picture of. I'm not familiar with the metal bracket that Joe sells, are you talking about the adjustable roof bracket? I prefer the wooden made bracket to metal. Due to the longer length it disperses the weight over several courses of slate thus reducing breakage in repair work. The technique with the slate brackets and planks on one side of the hip has been used for access for many, many years and is the standard in this area, the traditional method for repair. A tower of staging is far preferable as a base verses a ladder. I just recently set up a 20 foot hip exactly as described, using a ladder for access and short 3 foot planks to remove and install copper hip cap. Dependent on the location as well as the repair budget it often times works in with the numbers. Per your boom, I had the same results, it does attract lots of attention even when parked and was great advertising. On smaller repairs that what I would do, but I have metal bracket like what Joe sells. The thing with big truck like mine is that they may sit for a few weeks or longer but when you can use one, it may mean the job or just more work that you may get from having it. I have most likely done more lifts for non- roofings items, like post and beam, chimny work, turret-finials, stageing, carpentry picks etc. For the most of are work we, use a ladder or staging the quickest way to the roof. I like your telescoping boom Liam, the trouble I ran into with my bucket truck was with the knuckle concept, made it allot harder to maneuver and manipulate in tight quarters. I usually install traditional, wooden slate brackets and laminated planks up one side of the hip to facilitate removal and installation. The first set can be installed from ladder access. I have found this to be the safest and most time efficient method for doing hip flashing replacement. I always use stageing like in the picture with slate jobs and sometimes you have to uses a ladder lift because of limits in the proprety you are working on. Alot of times i build a tower of stageing just for loading a roof, it sometime its not even needed to do the roofing it just closer to there i can use the crane to get the slate up to roof level quicker. Love your boom truck Liam! Reminds me of the 1974 F-750 I had in years past. Had a 50' Holan Knuckle boom mounted on it. Great for materials handling. Found it great in certain situations and to help move equipment it was great! However in the end the limitations of fitting such a large truck into tight quarters encouraged me to swap to all pipe staging. I ended up selling the truck to Walter�s brother for a project he had going! Very good! It is very professional looking! Back to the original post from Tommy Bancroft. Tom. Set some scaffolding, and then get yourself either a man lift like Liam has or get some type of forklift with a man platform. $100,000 worth of equipment and you are all set! I us it to lift pallet and it has a one persom basket lift with remote control for some repair work. Its been a great pcs of equipment so far using it must more then for roofing. We install some post and beam, a cuplia, moved pcs of equipment, setting large staging project and more. Safety is very important for everyone if we are going to continue to be slaters. With the tearoff also, the debris is not falling to the ground and damaging the landscape or endangering the people below. I find that the owners will even get up on the roof if you have a fully enclosed scaffold around the perimeter of the building. I enjoy "showing off" and explaining what we are doing and why, and getting them into the whole process. I find that makes them some of your best "cheerleaeers" when it comes to getting more work. All of our work comes from referals anyway so that is very important. I noticed your boom truck too. Is that for materials handling or for access to the heights? We have a Pettibone forklift that we have on our bigger jobs that does most of the heavy lifting. What a blessing that machine is! the older my legs and back get, the more I appreciate it. Here are some picture of what I do for most slate work we do. 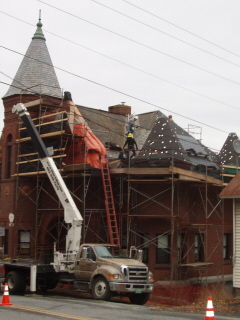 If we are working an a steep roof of any kind, we will always erect a sectional scaffold around the building or at least the area we are working on at the time. We have a lot of scafolding for one thing, our insurance requires it for another, and it just makes sense for a third. It really doesn't take that long to set up, and it certainly give a person peace of mind to know that there is a complete platform at the bottom of the roof to stack things on and to catch them if they slip. 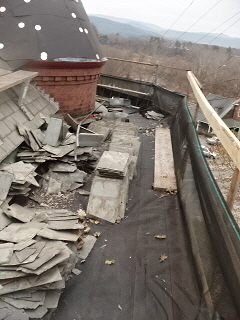 Once you have worked on a really safe roof, you will never want to work on another without the proper platforms. It is faster too because of the added safety and the places to store materials and the ability to lay out the whole roof. We will often work with he contractor building the structure, as it really doesn't make any difference to us when we build the scaffolding. We can come in and set it all up and then all of the trades can use it, and also share in the cost. It makes a lot of sense and it is faster in the long run. That is how we roll anyway. A few other ideas are to install or see if there is one, but a anchor point for a rope which would only would work depending on the slope. (What is the pitch/slope.). Then depending on your property and area to work with, a crane with a basket. So what is the slate nailed to, there got to be something there for the slate to be on. One way you can repair a hipped roof is, stage below the area that needs to be repair, then tie off the stageing or I bolt mine in to the wall. Then you can set a laddar on the stageing and up the roof to do the repair. You could also rent a basket lift too. Can you post a picture of you roof? my point is that I dont have sarking so the scottish roofers arent sure what to do. Could you measure out where the rafters run (vertically)and just nail the jacks over where they are? Why can't they nail there roof jacks in to the roof board you call sarking. I am working for a guy from Scotland rigth know in Vermont. Hope this helped. Hi everyone, BTW thanks for such a fantastic site - really helping me out here in Scotland. In Scotland normally roofs have boarding (we call it sarking) with a breather membrane on top and the slate is nailed straight onto the boards I think like you do. In England this is much less common . There they use battens (laths) and counter battens over a breathable membrane. I have an English style roof and it has two sides that are hips. All the roofers up here are unfamiliar with this type of roof and are asking how to get on the roof where there is no ridge to put a ladder on and no boards to easily put as roof jack into.